The essence of data visualizations is to tell a story. There are some great charts like Napoleon’s march to Moscow and Florence Nightingale’s chart on the causes of deaths in the Crimean War. Recently, my oldest son pointed out the following chart to me. Both are an image of Washington DC. 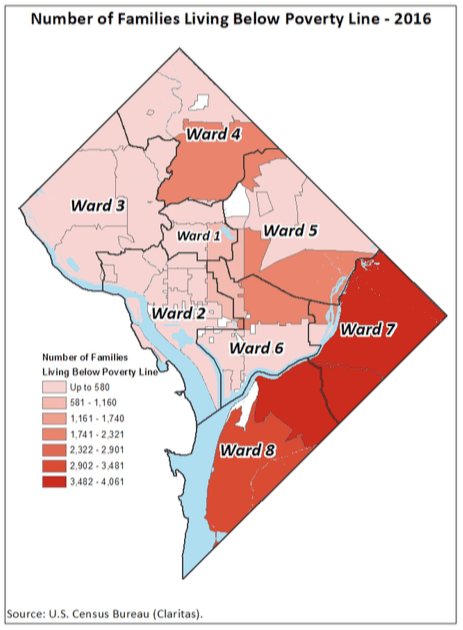 The first shows the number of families living below the poverty line by Ward. In other words, the dark red areas are poor. The second shows the average number of Emergency Room visits for children 0-17 years old. Do you see what I see? Where there is poverty, there are emergency room visits. Where there is wealth, there is health. There is clearly a correlation between physical wellbeing and socioeconomic well being. These two maps show a story way better than just the data in an excel chart ever could. They paint a physical picture that is easy to understand. I just spent the last 20 minutes looking at different interesting data visualizations. Some are truly inspiring. The lesson here is that Design is a key factor in getting your point across. It is not enough to just have the facts. You need to present those facts in a way that people internalize. Here is another chart showing a similar data link between poverty and poor health. I think it’s a perfectly good visualization, but it doesn’t tell a story. It’s statistics. Telling a great story this way is hard, but it is worth it when you get it right.